Nagaland, in the north-east of India is one of the least developed states on the subcontinent. It is made up of difficult terrain and is politically unstable. Many of the local people are struggling to make a living. 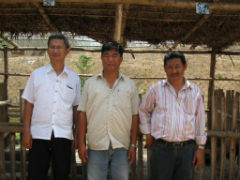 Bright Hope Nagaland is an attempt by a group of local people to introduce hope and change to their local communities. Back in 2003 some of the Bright Hope leadership team met Reverend Subong Aier. He was on the leadership team at SAIACS in Bangalore and he and his wife ran a boarding hostel for Naga young people in the city. We continued to follow his journey and after a couple of years he approached us with a vision. He returned to Dimapur in Nagaland and together with a team of people set up Bright Hope Nagaland. In 2006 BHW staff visited Dimapur to see what was going on and we liked what we saw. Subong had pulled together some high calibre people to commence a farm. The purpose of the farm was to generate income to be used for the establishment of community development partnerships, to model more efficient methods of farming and to provide livestock for the establishment of small scale farms. Over a two year period until the middle of 2008, a number of things have been developed and trialed. It has been discovered that dairy farming is not yet viable but that pigs, fish and poultry are very viable and the future farming will be based on these. Those living in poverty in rural Naga villages. The great team of high calibre people who are leading this partnership. The passion and commitment of Subong and Nerola Aier and some of the local Board members. The fact that local people have invested their own resources into the partnership. The very clear vision they have to establish self help groups as the primary outcome of the farm. N. Subong Aier was born and brought up in Mopungchuket Village, Nagaland, India. He became a Christian in 1973. Since that day forward he has been a follower of Jesus Christ. He received his primary school education in the village and went to high school in Mokokchung town. He then studied for his BTH in Calcutta, and both Master of Biblical Studies (MBS) and Master of Theology (MTH) in Bangalore. He got married to Narola Walling, a theological graduate, who was willing to serve the Lord with him. They have been blessed with five children, three daughters and two sons. After 22 years in active ministry of the Gospel, on 28th April 2002, he was ordained as a minister by the Ao Baptist Churches Association at Mopungchuket Baptist Church. While working as Registrar at SAIACS Bangalore, God gave them a new vision. The vision was for a holistic ministry and emphasised integrated farming techniques; this has been neglected by the churches in Nagaland. This is a new approach but applicable and effective in todays context, especially in the trouble torn and neglected state of Nagaland. With the assurance from the written Word of God and in obedience to God, they left SAIACS Bangalore and returned to Nagaland to undertake the task. Bright Hope World New Zealand came forward to be partner to this new venture, and the Bright Hope Nagaland was born. Dr. Achingla is married to Mr Benjung Aier and they have one child. She is married to a nephew of Subong, he is in the photocopier business. He is the treasurer. He is a businessman, and the cement distributer for the state owned cement company. He is also involved as a building contractor. 3. Dr Sunap Imchan – vet doctor – runs a government chicken breeding farm. He is very committed to this project and spends a lot of time at the centre and talking to people about the concepts. He is a key person in terms of setting up more Self Help Groups (BHSHG) in the future. 4. Dr Manjyang – vet doctor – deputy director Kohima vet hospital, which oversees the state veterinary strategies. He is married to Subong’s sister and is very generous and willing to work hard. He has been a great help dealing with a recent outbreak of swine fever. 5. 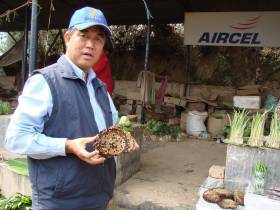 Dr Supong Keitzar – Director of Agriculture Department for Nagaland, Kohima. He travels internationally speaking to various government groups about development. He has some very clear concepts and understands the issues very clearly. He thinks that these small scale schemes are very important for the future food security of Naga people and fully supports the programmes. He retires in three years and could have a very valuable role in developing a Christian response to poverty in this and other areas. He is humble and very affable, but focused as well. He has donated two vermicompose (worm farm) units to the scheme to assist with development. 6. Mr Tako Longkumar – Managing Director Nagaland Government Hotels. He is very enthusiastic and asks lots of questions. He is sharp and easy to get on with. His wife is the niece of Subong and they are very generous. Early in 2008 a pilot project was established in the local area with 12 families. It is well set up and there are clearly documented processes. The board have used this pilot scheme as a learning exercise and will use this as a building block to establish more schemes like this. 1. Learning and working together to uplift the economic condition by rearing livestock such as pigs, cows, ducks etc. 2. To demonstrate and encourage others. 3. To involve church ministry through tithe and offerings. 1. The participant receives three piglets from the project and rears them for a year. At the end of the year BHN selects one of the pigs and takes it back to give to someone else. The people then keep the other two pigs to do what they want with them. They are encouraged to keep one for breeding purposes. 2. The participant receives a female piglet from BHN. 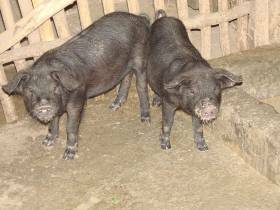 They then grow the piglet into a sow and return two healthy piglets from the first two litters, i.e. four piglets, to BHN for their use and further distribution. The participants sign on receipt of their piglets. Once there are many of these groups functioning, there will be many pigs coming back into the project as well as those being farmed at the base farm. It has the potential to become very big as long as it has the working capital in the next few years. This partnership has the ability to develop quickly because of the high calibre of the leadership team. Amongla is married with two children. She is shy and quietly spoken. 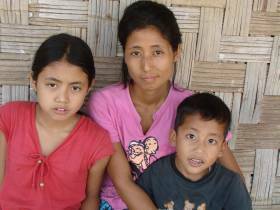 Her children are healthy and very friendly, and they both attend school. The oldest child communicates very well and enthusiastically answered some of the questions for her mother. The family live in a rented two room home which is well maintained. She is very grateful for the assistance she receives. Her pig is gaining weight and she dreams about the future when she will have many pigs to raise. She appreciates all the advice she receives about caring for her pigs The income generated from the sale of pigs will help pay for school uniforms and fees, and for purchasing more pigs. Amongla works very hard. She rises early in the mornings at 4.30am to start preparing food for the family and do household chores. The family also grow vegetables for personal use and to sell. The gardens are on the side of a hill and the water supply is fetched by walking 10 minutes up and down a steep hill. They are also raising 26 chickens for eating and selling. Caring for the pigs takes two hours a day which involves feeding them twice a day, cleaning the pen, gathering leaves and preparing food.